Decades of war, instability and intolerance in Afghanistan have fueled waves of Sikh emigration, reducing the community to just 372 families nationwide, says Awtar Singh Khalsa, right, association president of the Karte Parwan temple in Kabul. KABUL, Afghanistan — Outsiders may have trouble distinguishing between the turbans worn by Afghan Sikhs, with their tighter folds, varied colors and tucked-in edges, and those worn by Afghan Muslims, usually black or white with the end hanging down the wearer's back. 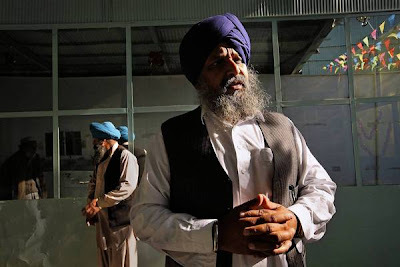 The subtle differences, however, and what they represent, have fueled widespread discrimination against Afghan Sikhs, members of the community say, prompting many to move away amid concern that the once-vibrant group could disappear. "For anyone who understands the differences in turbans, we really stand out," said Daya Singh Anjaan, 49, an Afghan Sikh who fled the capital, Kabul, for India after seeing his Sikh neighbors slain. "I'm sure the remaining Afghan Sikhs will vanish soon. Survival's becoming impossible." 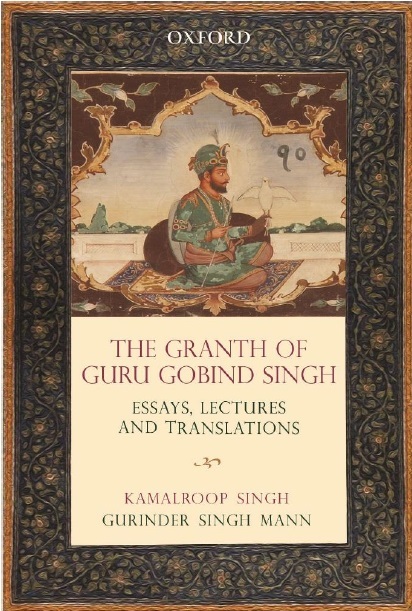 There are no exact records on when Sikhs, a 500-year-old monotheistic people from western India and modern-day Pakistan, arrived in Afghanistan, although most accounts place it around 200 years ago. Mostly traders, they prospered and numbered about 50,000 by the early 1990s, concentrated in Jalalabad, Kabul, Kandahar and Ghazni. But decades of war, instability and intolerance have fueled waves of emigration, reducing the community to just 372 families nationwide, said Awtar Singh Khalsa, association president of the Karte Parwan gurdwara, or temple. This is the last of eight gurdwaras that once operated in Kabul, he said. During the Afghan civil war of the mid-1990s, most of Kabul's solidly constructed gurdwaras were appropriated by battling warlords who shelled one another, destroying seven of them along with a Sikh school that once taught 1,000 students. Under Taliban rule, Sikhs had to wear yellow patches, reminiscent of the Jews under Nazi rule, and fly yellow flags over their homes and shops. Among the goals laid out by the United States and its allies after toppling the Taliban government in 2001 was religious tolerance for minorities, who account for about 1% of Afghanistan's population. In practice, Sikhs say, Afghan President Hamid Karzai's weak and embattled government rarely counters prejudice by the majority population, which emboldens attackers. Hooligans rob, insult and spit at them on the street, they say, order them to remove their turbans and try to steal their land. Particularly dispiriting, Afghan Sikhs say, are charges by the Muslim majority that they should "go home," even though they've lived in Afghanistan for generations and are protected, at least theoretically, by freedom-of-religion safeguards in the Afghan Constitution. Another disturbing example of the indignities they face is the treatment of their dead, many said. Cremation, a tenet of the Sikh faith, has been quietly practiced in Kabul's eastern district of Qalacha for more than a century. In recent years, however, some Sikhs who have tried to carry out cremations have been beaten up, stoned and otherwise blocked from doing so, at times decried as statue-worshiping infidels whose ceremonies "smell." Islam considers cremation a sacrilege. Many Sikhs said they've complained repeatedly to the government to little avail. "In the last decade, the Kabul government has specified 10 different places for Sikh burials and cremations, but villagers keep giving Sikhs problems," said Anarkali Honaryar, a senator representing the community. "Even when President Karzai issued a decree, nothing changed." While in New Delhi last month, Karzai said that Sikhs are a valued part of Afghanistan and that he was sorry so many had left. "We'll do our best to bring the Sikh community and Hindus back to Afghanistan," he said. Sikhs, Jews and other minorities enjoyed tolerance and relative prosperity until the late 1970s when decades of war, oppression and infighting set in. Although many Muslim families have also suffered hugely, Sikhs say they've faced worse pressures as a minority subject to forced religious conversions and frequent kidnapping, given their limited political protection and reputation for being prosperous. Pritpal Singh, an Afghan-born Sikh living in England who has documented the plight of Afghan Sikhs, said his brother was kidnapped shortly before the family left in 1992. "I really looked up to him; it was such a shock," he said. "They asked for crazy money and we couldn't pay, so they killed him." As conditions worsened, Sikhs turned increasingly inward, building a high wall around the last gurdwara to prevent passersby from stoning the building, and cremating their dead inside, normally unthinkable, to stem angry mobs. Khalsa said he's met repeatedly with Karzai but nothing changes, and meetings with bureaucrats and politicians often end with demands for money. "Corruption is unbelievable," Khalsa said. "The Taliban were far better than this government." For those emigrating, India and Pakistan visas are much easier to secure than those to Europe, so some stop there first, then travel illegally to the West. Although securing a short-term visitor visa to India is relatively easy, obtaining citizenship is a "nightmare" given India's bureaucracy and general indifference, said Paramjit Singh Sarna, an Indian community leader in New Delhi assisting Afghan Sikhs. It does not help that Sikhism originated in India and that Indian Prime Minister Manmohan Singh is a Sikh. Sarna said many Afghan Sikhs live in limbo in India. As "outsiders," they are unable to buy land or work, their travel is restricted, their children born stateless. Dhyan Singh, a 62-year-old Afghan Sikh who has lived in New Delhi since 1989, said he misses Afghanistan despite the problems. "Just last night, I dreamed I visited the Kabul gurdwara," Singh said. "It's only fear that keeps me away."